Blog Quick Quotes: Want2Scrap and Quick Quotes Inspiration Week - Day 2! Want2Scrap and Quick Quotes Inspiration Week - Day 2! Hi everyone, Gabriela here as part of Want2Scrap and Quick Quotes inspiration week! I did a project that you can use for you Thanksgiving table or have in your house all year long. This took me about an hour and a half to finish and it was very simple to make. I used a mirror for this, but you could use an old frame or a shadow box. I started with a12" round mirror, a chipboard die cut from Want2Scrap, Honeycomb 102, and Mahogany PowderPuff Chalk Ink. 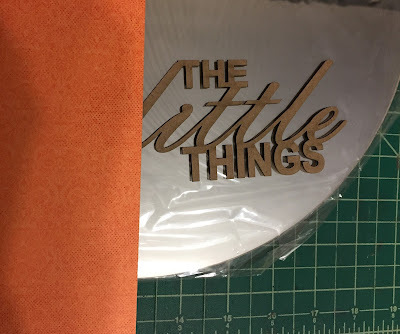 I inked "The little things" with Mahogany ink and then cut out "Give Thanks for" on my Cricut from the Honeycomb paper. While I let the chipboard dry, I put the Want2Scrap bling around the edge of the mirror for a decorative effect. This part took the longest, but I put on some music and I was done in about 30 minutes. To make attaching the letters easy, I used my Xyron to put adhesive on the back of the paper and the chipboard. Finally, I attached the words using a ruler and my cutting mat to line everything up; here's the finished project. The first picture was taken with nothing in the reflection and the second was taken to show how the words look with a reflection of something. I am planning on getting a plate stand for this so I can display it for Thanksgiving! If you use a frame or shadow box, you can hang it on the wall as décor for the whole year. I hope you liked this project and you give it a try, thanks for stopping by. Don't forget to leave a comment to be considered for a yummy prize! Love your mirrored decor, Gabriela. So clever and creative. Love the mirror. I think I might make a motivational mirror. very pretty and creative project! What a creative use for bling - no project is complete without it! The mirror turned out beautifully!